-- Select Article -- No Articles Found! Inspired by international achievement in mathematics, a group of over 100 UK schools – the Mathematics Mastery partnership – are working together to prove they can do better. The OECD’s PISA 2012 tested more than 510,000 students in 65 countries and economies on maths, reading and science. The main focus was on maths, as maths proficiency is a strong predictor of positive outcomes for young adults; it influences their ability to participate in post-secondary education and their expected future earnings. Shanghai (China) and Singapore were top in maths, with students in Shanghai scoring the equivalent of nearly three extra years of schooling compared to their counterparts in most OECD countries. Several other Asian countries were also in the top-performing group, as well as three European neighbours – Liechtenstein, Switzerland and the Netherlands. While these findings have made national news several times, they were no surprise to school leaders and teachers in the Mathematics Mastery partnership – a group of professionals in over 100 schools who have been learning lessons from abroad for several years. For them, these stories of international success are inspiring, and show just how much children are capable of. Here are five key things these schools have learnt from abroad, and which countries they’ve learnt them from. In higher-performing jurisdictions, they really care about learning mathematics. Furthermore, they genuinely believe mathematical success is possible for all, a belief that’s dangerously lacking in the UK. Acting as if maths is for ‘clever’ people (whether you’re a parent, teacher or government minister) has been internationally demonstrated to be damaging. It is not okay to be ‘bad at maths’, but that’s fine, because nobody need be in that position. Children whose parents have high expectations perform better: they tend to try harder, have more confidence in their own ability and are more motivated to learn. While we’re working on changing the mindsets of parents, we need to make sure that school leaders, teachers and all other adults working with pupils have the very highest expectations for them. At its simplest level, this means that in a situation where a pupil doesn’t fully grasp a new concept or idea the first time it is taught, instead of using this as evidence to label them as a mathematical ‘low achiever’, the teacher finds or makes the time to try alternative explanations and approaches. Ofsted commented on the impressive impact this persistent dedication had on every child’s success when they visited one of the Mastery partner schools, ARK Conway. In Singapore, they spend several weeks looking at the number ten, even when many of the children can count well beyond a hundred. Surely all this time with the first ten numbers is a waste? Well, no, and for two reasons. First, because there is a difference between knowing your numbers to ten, and really understanding them. Countries like Singapore push children to understand these foundational concepts deeply, and they stretch the most successful pupils not by giving them the next set of numbers (i.e. numbers to 20), but by offering them ways to explore and apply concepts, especially through problem solving. The second reason why spending several weeks on the number ten might be a good idea is that these countries insist on all pupils reaching the same high standard, from Singapore to Switzerland. They recognise that some pupils enter school without these foundations, and that time is needed to pull them up to this level. Interestingly, many of the higher-performing countries do set or stream students, but placement in a ‘lower’ group never limits access and opportunity, unlike in the UK. In Liechtenstein, for example, all three tiers follow exactly the same curriculum, so pupils can switch from one level to another according to performance. This means that the very brightest pupils are studying the same mathematical content in these countries as the weakest – what is different is the way in which they are being taught and the level of support they are given. Maths is a hugely relevant subject, applicable throughout everyday life and vital to many people both socially and professionally. But is this how it seems in the classroom? Much work has been done in the Netherlands to make maths more meaningful, including a coherent, systematic approach to the introduction of different representations. When should pupils use cubes, and when a number line? How can teachers help pupils to make connections between a word problem, a diagram, a ‘traditional’ calculation and a mental method? There is a wealth of research (both theoretical ponderings such as those of Hans Freudenthal and evidence from practice) in the Netherlands to demonstrate the importance of ‘hands-on’ learning in maths. Pupils manipulate objects, and work with pictures and diagrams to give abstract mathematical concepts meaning and relevance. Deepening conceptual understanding through use of physical and diagrammatic representations, as demonstrated so effectively by countries such as Singapore and the Netherlands. explicitly teaching pupils to discuss mathematics in grammatically correct full sentences with accurate terminology – again, a key priority in Asian countries such as Shanghai, where exposure to a more ‘formal’ treatment of mathematics (algebraic and geometric) has been credited with their success in PISA. mathematicians, through giving them opportunities to seek patterns and rules, and to ask and answer open questions. 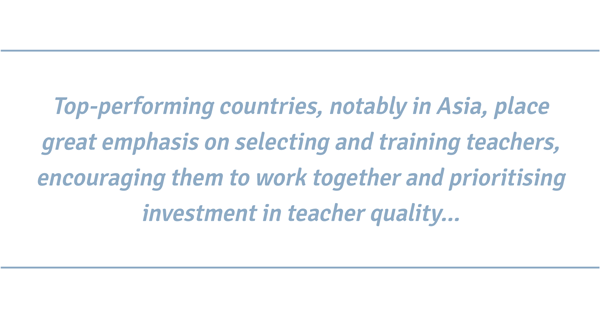 Top-performing countries, notably in Asia, place great emphasis on selecting and training teachers, encouraging them to work together and prioritising investment in teacher quality over reducing classroom sizes. Teachers in UK classrooms are keen to develop their own mathematics, and their understanding of the most effective ways to teach this subject, as the nation’s high membership of organisations such as the National Centre for Excellence in the Teaching of Mathematics (NCETM) demonstrates. But for a real transformation in achievement, teachers and their school leaders need to make a significant investment in professional development. Yes, children in Switzerland study mathematics for four or five hours a week, plus homework, but just as important as the time dedicated to learning mathematics is the high quality of that learning. Teachers in Singapore benefit from a guaranteed 150 hours a year of professional development; teachers in Shanghai complete 240 hours of further training in their first five years of teaching. High-performing jurisdictions demonstrate that teachers as well as pupils must have sufficient time dedicated to learning. Lesson 5: The most important lesson – keep learning! A key lesson to learn from high flyers Shanghai and Singapore, however, is to continually develop and improve our country’s classroom practice. While holding firmly to ‘traditional’ values of hard work and high expectations for every child, these leading countries constantly look at what is working in their own schools and internationally, and take a very ‘modern’ approach to revising their curriculum and teaching practices. An ongoing openness to ‘foreign’ ideas is at the heart of these countries’ success. Helen Drury has taught mathematics and studied mathematics education since 2002. Whilst remaining a classroom practitioner, she carried out research with Oxford University and the Open University, and was awarded a PhD in mathematics education. She was Head of Mathematics at the Bridge Academy, Hackney, and a member of Sir Michael Wilshaw’s senior leadership team at Mossbourne Academy. Join the team and find out how to use the world-class Maths Mastery approach to: promote progress and attainment, build on pupils’ knowledge, and prepare for 2014 demands with the new National Curriculum freedoms.